These TPE non-slip friction pads hold any type of material in place, allowing users to route, sand, drill, carve, and paint without clamps and with assurance the workpiece will not move. 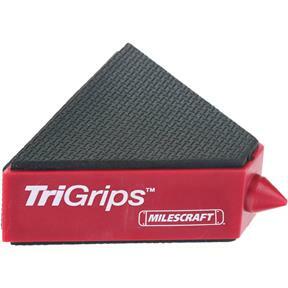 When on their flat side, TriGrips™ holds a work piece 1-3/16" above the bench top. When set on edge, TriGrips™ raise the work piece a full 3" above the bench. 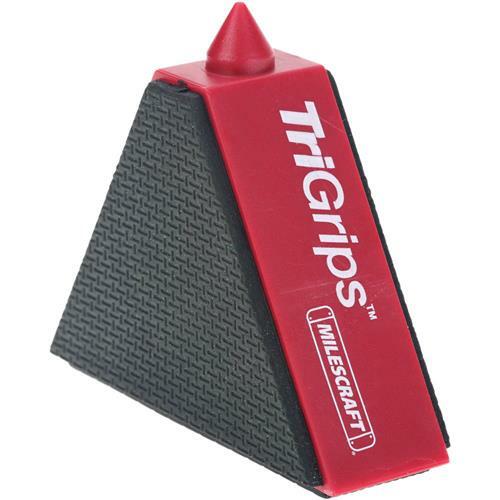 In combination with the cone-shaped tip formed into one corner of the block, TriGrips™ offer a no-extra-cost alternative to single duty painting supports. Self-adjusting, stabilizing internal ballast flows to the base of a unit set in the vertical position. TriGrips™ support larger work at its edges, narrower, longer work along its median, or when grouped together form a concentrated center support. TriGrips™ can also be used as support for non-work projects, such as beneath a computer keyboard. Single support. I wish they were a little bit bigger. But they work well. Good idea when I need that little extra help to elevate or hold a project in place without pressure from a vice or spring clamp.